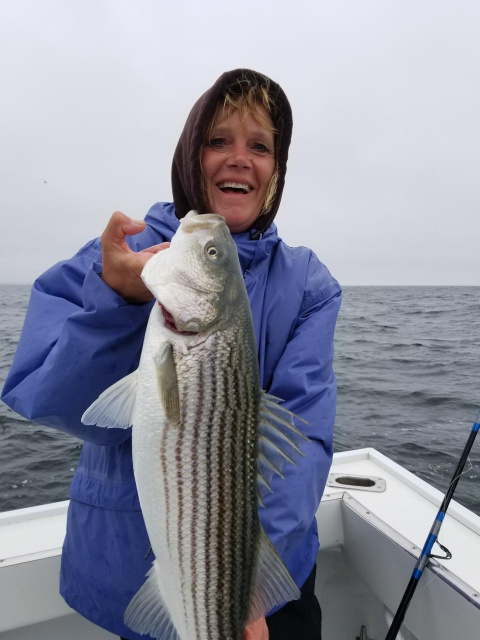 Striped bass, commonly called Stripers have been abundant in the waters of the Merrimack River off of Plum Island, MA for decades. Conservation efforts have resulted in an increase in their size and the size of the schools of fish in the area. Call Lee to book your charter for an exciting half-day of sport fishing for bass and blues aboard the Sydney Lee. Sport fishing for bass from Newburyport and Salisbury, MA waters is always an adventure. The fishing vessel Sydney Lee with Capt. Bob Yeomans and crew will often take you to waters in the Gulf of Maine and off the Isle of Shoals. Click on any photo below to start our slide show.